Fast moving warblers in spring can often look similar. 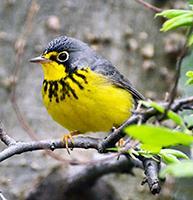 You see a flash of bright yellow underneath and a necklace…..which is it – Magnolia or Canada Warbler? Here are a few tips to help you decide. 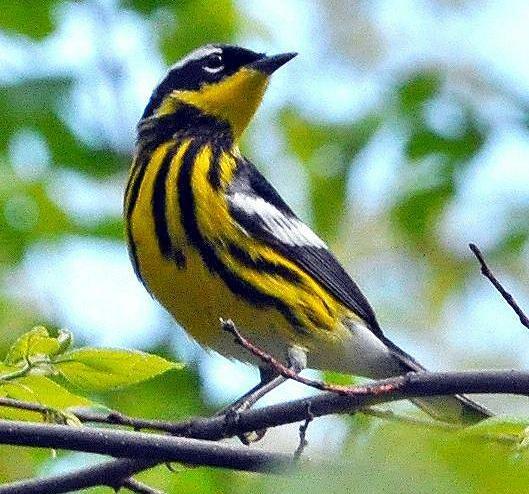 Magnolia Warblers can be stunning in spring. With long tails and small bills, their necklace is a bit longer than Canada Warblers, and it radiates from a neckband. Magnolia Warblers also have white under their tails, a black mask, white wingbars and black on the backs of their necks. When their wings are closed they seem to have a small square white “handkerchief” on their wings. Canada Warblers are grey on top and yellow underneath. Their necklace looks thinner around their throat and they have a white eye ring. The females look like paler versions of the male. Side by side, the Magnolia Warbler has more color combinations and visual complexity than the Canada Warbler, although the males are equally beautiful. Both birds are iconic spring warblers and good ones to be able to differentiate in the field.